Title: How Do I Compare an Author's Purpose? 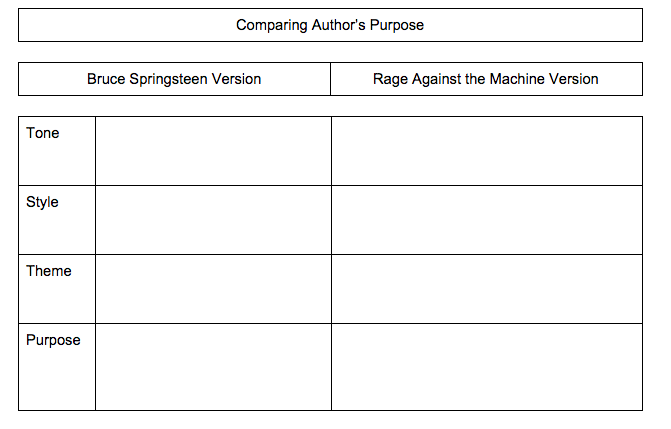 Content Objective: I will be able to determine and compare an author's purpose in a text by using the given graphic organizer and comparing two versions of a song to create a paragraph. Language Objective: I will correctly use the term "purpose" in my writing. ​Homework: Choose a song or poem that you will present in class. 2. What is Author's Purpose? Do Now: Why do you think people write books, songs, or poems? Step 2: What is Author's Purpose? 1. Later on in this unit, you will practice interpreting the author's purpose in a song, poem, and/or speech. You will also have to create your own author's purpose for your own speech. Today's lesson will help you become familiar with an author's purpose. 2. Let's look at lyrics to the song "The Ghost of Tom Joad" together and determine the author's purpose. Click here to read the lyrics. Think about what this song is about and why the author wrote it. Then, share your ideas with your table. 3. Copy down the graphic organizer below. This is where you will gather your ideas to create your paragraph. Share your thoughts with your group. Then fill out your graphic organizer for that version. 5. Finally, let's listen to Rage Against the Machine's version of the song. Share your thoughts with your group. Then fill out your graphic organizer for that version. Exit Slip: Do you think that Bruce Springsteen's purpose for the song "The Ghost of Tom Joad" differs from Rage Against the Machine's purpose for the song? Give specific examples to support your claim. Click here to answer the assignment on Actively Learn. 1 - Paragraph does not respond to the prompt or is unclear because of CUPS errors.